This article, with an exclusive video interview, originally appeared in T.H.E. Journal's September 2013 digital edition. For district leaders, the modern school system can be a maze of options, with dead ends, wrong turns, and delays leading to classic paralysis by analysis. Solving the maze from within can be difficult, but rising above the labyrinth with geovisual analytics can illuminate the finish line. For the uninitiated, geovisual analytics is an emerging interdisciplinary field integrating visual analytics and geographic information science. Essentially, the software sorts through massive amounts of data from school and local government sources to help school administrators find patterns and trends. These patterns can then be displayed visually--for example, layered over a district map. "It definitely beats staring at a spreadsheet," says Chuck Amos, CEO of Minneapolis-based GuideK12, a geovisual analytics software company. "By adding the geographic, visual dimension to your data, we bring out insights." What sort of insights? Many schools, for example, are dealing with student attrition, and school boards want to know why. "We can help identify patterns of loss if schools are losing kids to private or charter schools," says Amos. "With the right kind of insight, planners can react appropriately and determine what kind of magnet schools could attract those kids back to the local school system." Amos tells the story of a recent GuideK12 district that decided to explore the impact of combining middle schools, by looking at local crime statistics. "They wanted to analyze gang territories and work with local police to determine school safe zones," explains Amos. "The police in many communities collect those statistics, and they can be brought into our software." Amos says that objective software analysis can even help cool the heated topic of race. Specifically, he cites a situation in which one school's racial balance was thought to be markedly different than the overall district. That perception turned out to be incorrect, and GuideK12 helped correct the misunderstanding. "Racial balance tends to be a highly charged issue," Amos says. "When the issue was raised at a meeting, school officials were able to bring up information on the fly that showed racial balance at the school in question was actually within a very small variance of the overall district racial balance." 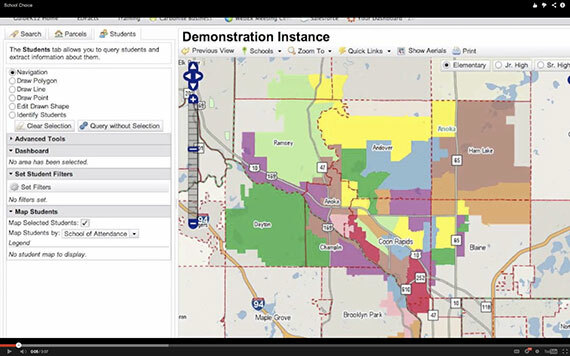 The speed at which the software can produce actionable data is something that Robert R. Emerson, assistant superintendent of educational services at Farmington Municipal Schools (NM), really could have used during an arduous middle school redistricting process. Looking back on the marathon meetings that he endured without the help of GuideK12, he estimates that the software could have cut the redistricting time by two-thirds. "That process was the impetus for looking for a different software package that would help us in future projects," says Emerson. "We're going to be redistricting our elementary schools probably the year after next, and it's going to be so much easier and quicker." Any redistricting initiative can be a daunting prospect, primarily due to emotional parents worried about their children's future. Even in the relatively small, 40,000-person community of Farmington, misconceptions can cloud an otherwise straightforward decision. "People have preconceptions about neighborhoods and the kids who live there," says Emerson. "Then you go and actually look and see who lives there, and suddenly people say, 'Wow, we thought kids who lived there were all poor or Hispanic,' when that's really not the case. It's helpful to eliminate some of those misconceptions. The software can take that out of the picture and show the real situation and demographics." From there, the mission to balance the number of children in each school along ethnic and socioeconomic lines becomes less emotional. "The software lets you talk numbers," he says. "And the work goes a lot quicker." Decisions regarding attendance boundaries involve many different factors, and Ruben Morales, an assistant principal in the Miami-Dade County Public Schools (FL), agrees that emotions run high among parents. Lines on a map, however, do wonders to quell those emotions. "As you are drawing these maps, you can give parents a logical reason as to why certain blocks can't go to a particular school, because there might be a natural boundary, such as a canal," he says. "So if students are walking home they might have to go an extra 10 to 15 blocks because of that canal. Another school, on the other hand, might be a shorter distance and make more sense." Miami-Dade's CIO Debbie Karcher says that the GuideK12 software's mapping function has been a boon when it comes to establishing attendance boundaries. "The engine that this product is built on does the census count," she says. "That makes it a scalable and efficient engine, which is difficult to find in the K-12 market. This software will receive any kind of data you can send it and will present it on a map, so you can get a geovisual display of just about any kind of data you want." Emerson adds, "We see patterns in growth that tell us there must be a lot of young families moving into an area because the number of kids is growing. Down the line, that is really going to help us. Right now our enrollment is fairly flat year-to-year, but a few years ago it looked like we were going to have to build new schools. If that starts to happen again, GuideK12 will be invaluable, because you'll be able to quickly see patterns of where kids are living." Redlands, CA-based Esri (Environmental Systems Research Institute) provides geographic information system mapping software and geographic data content. While Esri GIS mapping tools can serve many purposes, including visualizations of the recent tornado destruction in Moore, OK, they are also useful in K-12 education. According to George Dailey, program manager of GIS in Schools for Esri, the "foundational geographic nature [of GIS], coupled with its ability to interrogate data, model possibilities, and augment decision-making, means that GIS is pervasive and present in all areas of K-12 education." Dailey reports that Esri's GIS capabilities are routinely used for choosing locations for new schools, assigning students to schools, picking bus stop locations, designing school evacuation plans and safety zones, routing delivery of cafeteria food, and analyzing outside lighting needs or maintenance. Officials at the Davis Joint Unified School District (CA), for example, used Esri to examine the effects of closing the district's Valley Oak Elementary School. Esri analysis revealed that only eight of the 122 K-3 students within one-mile walking distance of Valley Oak would be further than one mile from another school. This bit of data, in addition to many others, ultimately led to the decision to close the school. Even on the athletic field, geovisual analytics can play a role. Farmington's Emerson explains that parents are all too willing to lie about where they live so that their kids can play on high-level sports teams. He uses GuideK12 to foil the pretenders. "One school was getting too big for its space because everybody was self-selecting that school, primarily because of the high school it fed into," he says. "GuideK12 ties into our county assessor's office database. When somebody says, 'I live here,' we can go into GuideK12 and find out if he or she actually owns that property, or is it an uncle or someone else? Sometimes it's a business address." In some cases, people give guardianship of their kids to other people who live in other attendance zones just so the child can go to a certain school. "We can also use Guide K12 to check addresses of those guardians," says Emerson. "It has really helped in that process, and made it a lot quicker to review those waiver requests…. Now we're getting fewer people lying because they know they're going to get caught." Some school districts may continue to crunch data the old-fashioned way, but Dailey is convinced that truly effective school district management should include a geographic analysis using high-tech tools. "GIS is especially valuable for facilities planning, demographic mapping and student geoanalysis, school transportation and logistics, safety, security, stakeholder information access, and the growing area of campus and facility management," he says. Ultimately, Miami-Dade's Karcher believes the very existence of GIS and geovisual analytics software is a testament to the technological--and financial--considerations of the modern school district. "There are pressures on public schools to behave more like private, charter, and virtual schools," she says. "So schools must start thinking like businesses."